A satellite TV signal passes through three basic stages to get to your receiver: a television programming signal, an uplink to a satellite orbiting the Earth and a signal to dish pointed at it. Problems with any one of the stages can cause your receiver to lose a signal; either all of it or only a single channel. 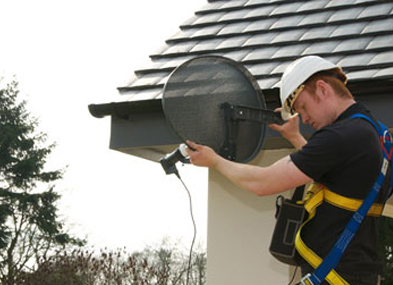 If you are in around Greater Manchester elecsat can send an engineer to the align your fix dish in less than 24 hours. Weather can affect uplinks and received signals. Usually uplinks send plenty of power to burn through thunderstorms, but some can be so severe that they prevent the signal from reaching a satellite. Some satellites receive signals from several sources, but it is unlikely that more than one will be affected at the same time. However the dish at your home may lose all signals if pointed directly through a thunderstorm, even it isn't raining at your location. Look in the direction your dish is pointed and wait for a storm to pass. If you are in around Greater Manchester elecsat can send an engineer to the align your fix dish in less than 24 hours. Dishes that point at satellites must be aligned to the satellite. The parabolic reflector concentrates the signal into a narrow beam, and even a slight movement can cause a considerable decrease in signal level. Even though firmly mounted in place, dishes may move out of position and cause the signal to fade. Erosion, high winds, accidents or earthquakes can also cause movement. Trees may grow in front of a dish and block the signal. Most satellite receivers display a signal on your screen so you can check your level from time to time to ensure a good signal. If you are in around Greater Manchester elecsat can send an engineer to the align your fix dish in less than 24 hours. Technicians, engineers and craftspeople can make errors or have accidents. A single cable disconnected by mistake in a broadcast studio or an uplink station can cause the loss of one program or a major outage. The technician who installed your dish may have left the bolts loose to cause it to blow out of place with the first heavy wind. Pets or children can inadvertently step on or press a button on a remote control, creating the appearance of a loss of signal. 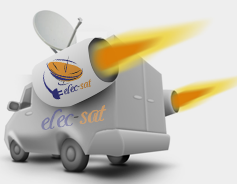 If you are in around Greater Manchester elecsat can send an engineer to the align your fix dish in less than 24 hours.